Hi Everyone! I am here today to share a preview of the April My Time Made Easy products!! I was so excited this month to see this first template i'm previewing. 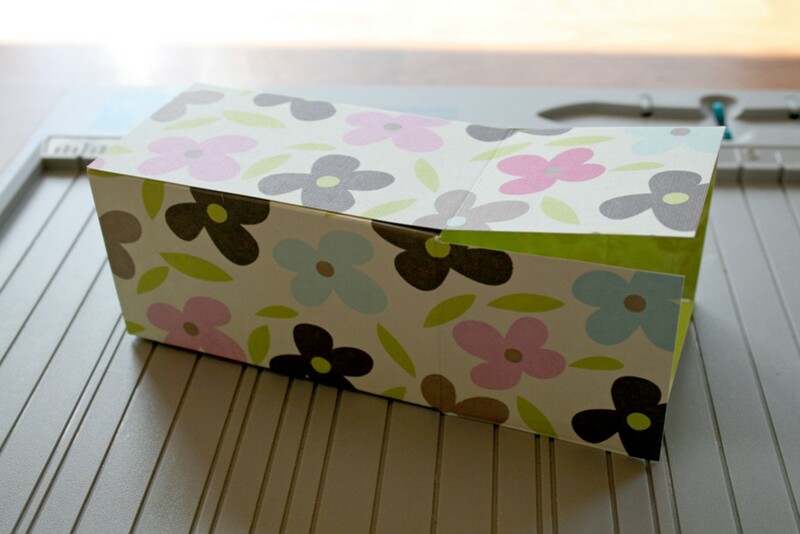 It's called Com-pleatly Versatile and it includes these great boxes. I absolutely love little boxes and these are some of the easiest I have ever assembled. 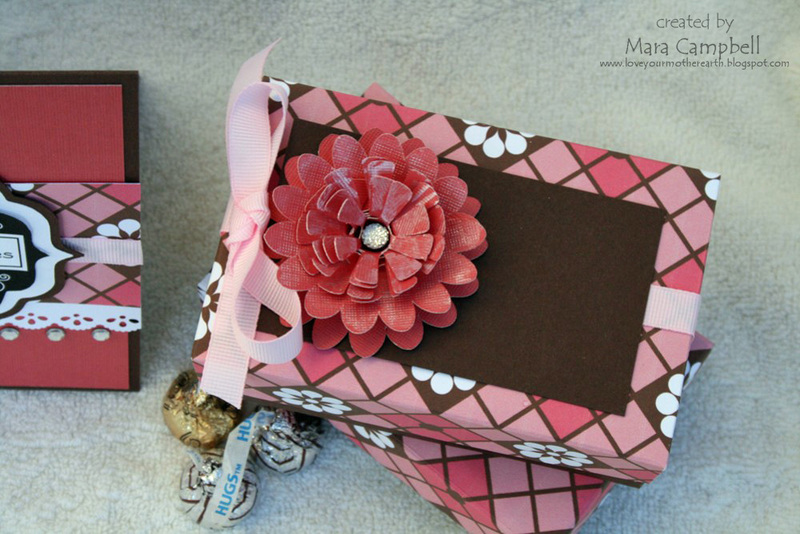 The template includes this smaller size box and a bigger box template. I love this smaller size! 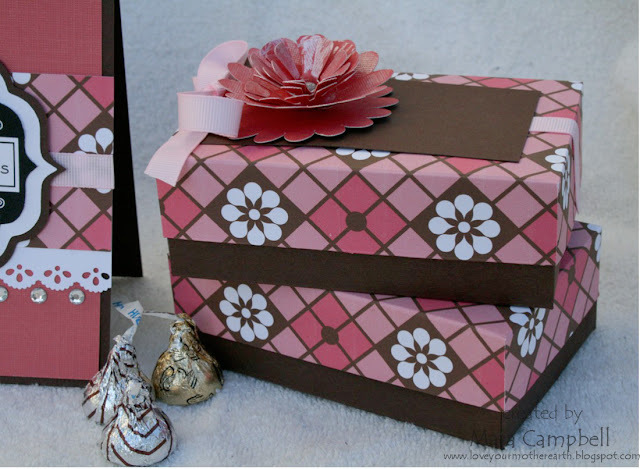 I've used a new digital paper set, Berry Burst, to create the box tops. And how about that big rolled flower? This month MTME is offering 3 rolled flower templates. The one I used is called Rolled Bloom-Daisy. They are super easy to use and add so much dimension. There is also a new Bloom Builder cut file that I used to add some dimension to the base of the rolled flower. Too much good stuff this month, I swear. And guess what's in the boxes? 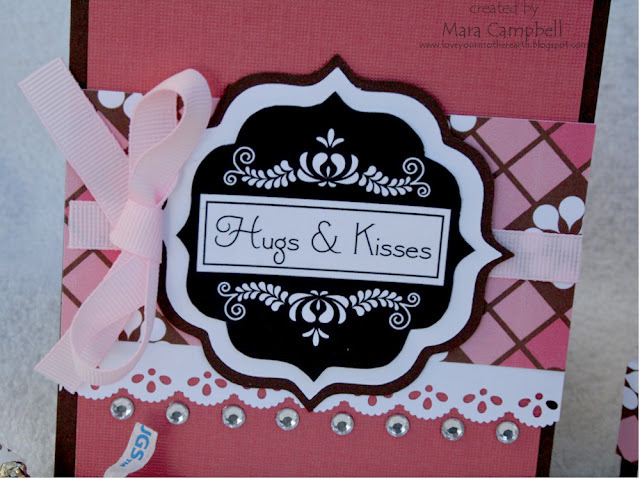 Hugs and kisses, of course!! Now let's talk about stamps. MTME has a new stamp set this month called Fine Finish stamp set that coordinates with the Fine Finish cut files from last month. I really love how everything coordinates and you can create lots of layers on your projects with just a few products. I have been cutting all my templates and cut files with the SCAL software on my Cricut. But if you have another cutting machine, like a Silhouette, MTME offers the file types for that as well. And if you don't have a machine, there are pdf files that you can print right on your printer. There is no excuse for not using these great templates! There is more goodness being shared today...please check it out! Thanks for stopping by today. I will be back tomorrow for another great reveal for MTME! It's my turn to throw down a challenge for my Papertrey Princess blogging group. I love to use my background stamps so this challenge is just that...use your background stamps on a project! On my card I used the Background Basics: Geometric Set by Papertrey Ink. I usually reach for my polka dot background stamp set, so it's a fun change to use something different. I don't typically use a color for the base of my card. I usually start with kraft or white cardstock, so this is a bit different for me. The paper is Momenta and the sentiment is from another Papertrey Ink set. So break out those background stamps and get to work! I can't wait to see what you all create. Thanks for stopping by today. Hi Friends! Is it really only Tuesday? I think my brain is still in vacation mode, I am having a rough time getting started this week. 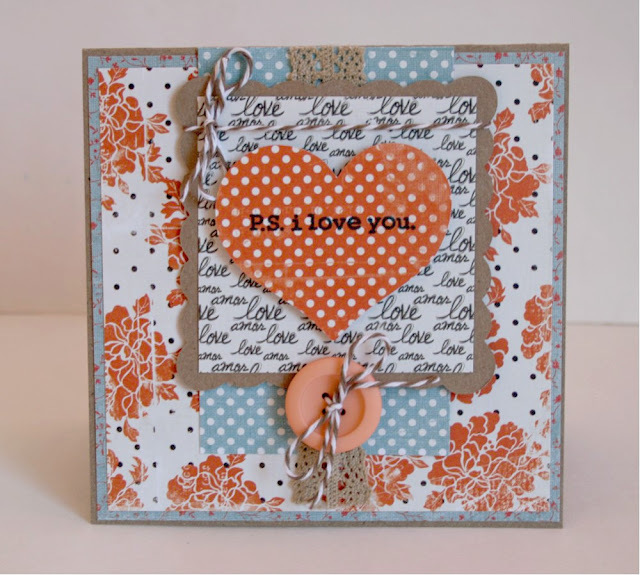 I have a quick post tonight of a card I made using Momenta goodies. I really love their Pyramid Pads. You get 12x12 paper but you also get a cascading assortment of smaller sizes as well. 10x10, 8x8, 6x6...they are really fun to use. For this card I used the Kaleidoscope Pyramid Pad, I love the bright colors. I used my Martha Steward border punch to create the cascading border. I also added a sweet cocktail sticker by Momenta. They really have the best stickers and I find myself reaching for them more and more. And I used one of my favorite sentiments from Papertrey Ink! Happy Monday! We are back to school and back to work today after a long weekend camping trip. It started with a blown trailer tire on the freeway in the first 30 minutes, ugh!! Luckily that was the worst of it and we had a great time camping right on the beach. It was a bit cold but that didn't stop my kids from swimming and boogie boarding in the ocean. I watched from the sand, wrapped up in a sweatshirt! I've been playing with my new Unity stamps and here is another card. I just love this bowl of cherries and the fun sentiment to go with it. I used some watercolor pencils to color the cherries red. And added some fun embellies the squares that didn't have stamping. I was lucky enough to win the Blog Friday with Friends giveaway over at the Unity Blog last week and they sent me a BAGFUL of stamps as a prize!! I swear, there are at least 25 stamps in this bag. I cannot wait to start using them, there are some fun ones in the bag. Now all I need is another spring break where I can just sit and stamp. Anybody know where I can find one of those?? Hi Everyone! We are taking advantage of my kid's spring break with a long weekend getaway. We headed south and are camping at one of our favorite beach spots this weekend. The only problem with that is the spring break weather we are expecting isn't exactly 'bikini and slushee cocktail' weather. But regardless, we love camping at the beach and will enjoy ourselves even if we are wrapped up in sweatshirts and drinking hot chocolate. I have a really fun recipe to share today that is a knock-off of a Ben & Jerry's ice cream flavor. Chubby Hubby ice cream contains peanut butter filled pretzels, fudge, and more peanut butter. And it's fabulous. These bars are that ice cream...in a convenient hand held format. There are mini peanut butter cups and pretzels in the batter. 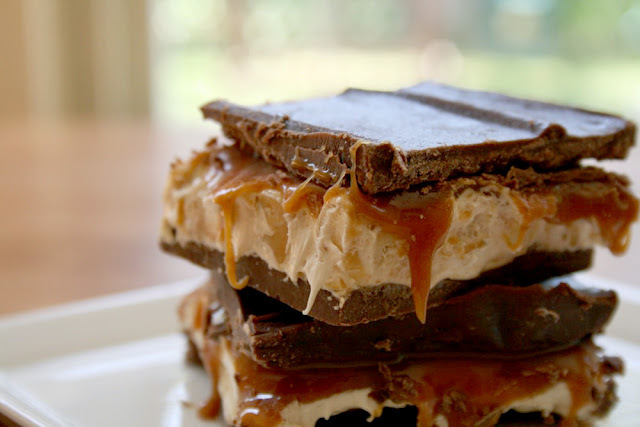 And a layer of caramel and a layer of chocolate on top. It really seals the deal on these decadent bars. These will definitely make you a little bit chubby if you eat the whole pan so make sure you bake these to bring to a party to share with lots and lots of friends. And new friends because these bars with definitely make you some new friends. So now I want to know...what is your favorite Ben & Jerry's flavor?? 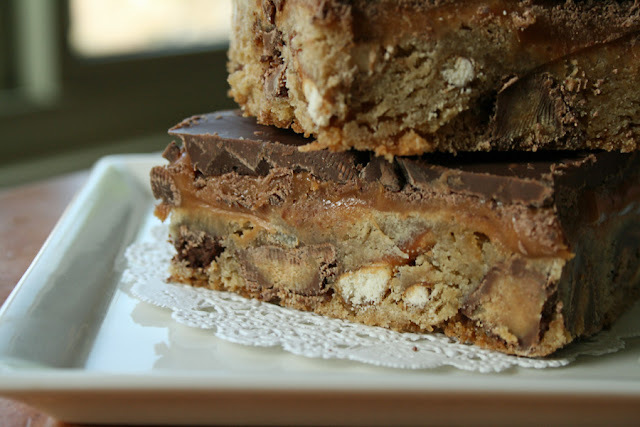 And head over to the Cookies and Cups blog for the recipe: Chubby Hubby Bars. I love doilies. Which is weird because I don't consider myself a doily-type of girl. Although I don't really know what that type would be. I am always tempted by the medallion and doily stamps that are so popular right now. But I dug around my older stash of stamps and found a set from Close To My Heart called Endless Love. And it had just the stamp I wanted! It's not really a doily, but it's a big circle with added stuff around it. Which I think IS the scientific term for a doily. I stamped it about 3/4 of the way on my white cardstock, then added that to a purple cardstock base. A few strategically places gems, some yellow cardstock, 2buttons, and a Papertrey Ink sentiment and my card was finished. Oh wait, and some baker's twine!! It's been a long time since I used this set! I am so glad I found it, I love that big round fancy stamp. This stamp set is going on top of my stamp pile, so I can reach for it again soon. Tell me...do you like doilies? Do you use them? What's your favorite doily/medallion stamp set (if you have one)?? Happy Tuesday everyone! 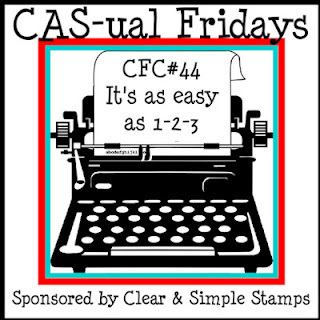 I have a card for the CAS-ual Friday challenge blog to share today. The challenge was to use 1 patterned paper, 1 sentiment and 1 image. Here's my card! I just ordered a bunch of Unity Stamps and I couldn't wait to ink this one up! I love the cute mushroom and the owl. I added a little bit of paper piecing to the mushroom top using the same patterned paper. The sentiment is also Unity. I then added some twine and some bling and I wonder if my card is clean and simple anymore? But regardless, i'm sharing it for the challenge!! I can't wait to play with some more of the Unity Stamps I bought. So much fun to discover new-to-me things. Yes, I love thin mints. They are my favorite girl scout cookie. I love them almost as much as I love using baker's twine. So you know i'm not messing around. I saw this recipe on Cookies and Cups and just KNEW I had to make it. I took them to a St. Patrick's Day party this weekend so I would not eat the whole pan by myself. Because that really might have happened in the past. 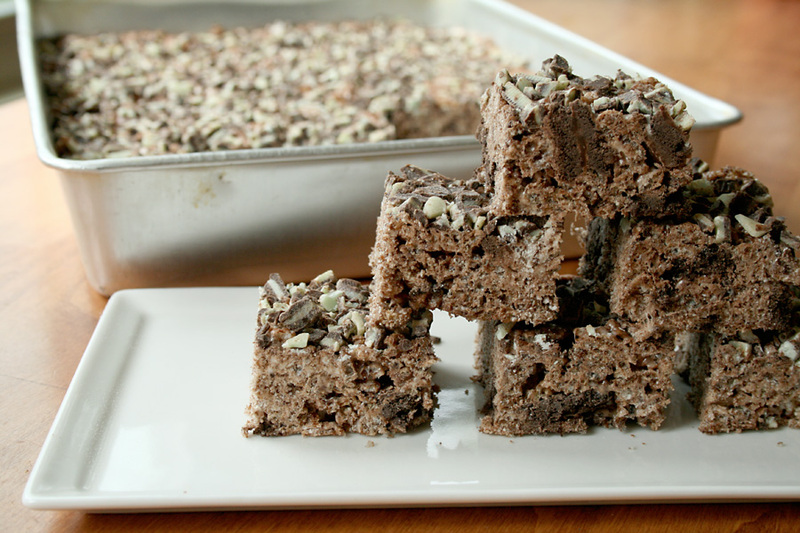 You make these the same way a regular rice krispy treats, starting with melting the marshmallows. But instead of using rice krispies, you use cocoa krispies and mix in chopped up thin mints. Then mix with the marshmallow and press into the pan. AND THEN top them with chopped Andes Mints! Yes, they were amazing and minty. And they were eaten at an alarming rate at the party. And not only by me, thanks for asking. 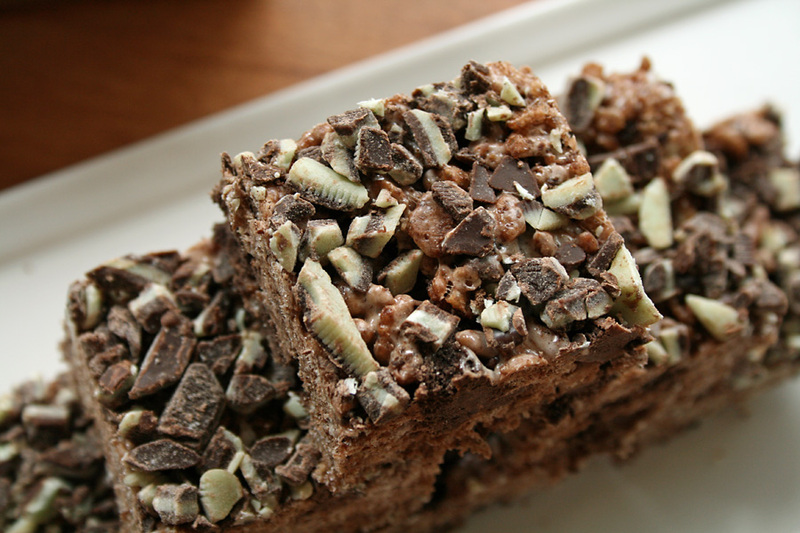 Hop over to the Cookies and Cups blog for the recipe: Thin Mint Rice Krispy Treats. I changed it up a little bit by using a 9x13 pan and I didn't include the Andes Mints inside, just on top. Did you know you can buy already chopped up Andes Mints? No unwrapping 50 mints and then chopping them up! I hope you had a great weekend, Happy Monday!! Hi Everyone! Happy St. Patty's Day! I hope you have something fun planned today. My husband made green pancakes this morning and we are going to a party tonight where there will be lots of corned beef and cabbage and green beer. No corned beef or cabbage for me, but i'll take seconds of the green beer! Here is a St.Patty's Day card I made for PSA Essentials last year and thought it was appropriate to share today. Hope you have a great weekend Friends!!! Today is the day that all the girls in my card club reveal their cards! Joni sent us all some amazing supplies this month and i'm sorry to say that I tore into it before taking photos of what she sent. Bad club member. I loved everything she sent and had such a fun time creating! I fell in love with the colors of the papers she sent and I thought they went well with some aqua mist cardstock from PTI. She also sent flowers already diecutted (is that a word??) so all I had to do was roll them up to create these great rolled flowers. She also stamped great sentiments from Unity Stamps that I used for this card. This stamp is from the Hello My Friend set. I had lots of paper left so I created another card. Plus, who could pass up these gorgeous butterflies?? This is such a unique sentiment from the Happy for this Moment stamp set by Unity. And you better believe that I used every rolled flower she sent, I loved them! The heart stick pins were another favorite of mine from her kit, I used these two and created some fun flags for embellishing. I love being part of this group and I really love getting happy mail. Each kit so far has been so unique and fun to work it. Thanks Joni for a great card kit this month!! Check out the other girls in our group and what they did with the kits. Thanks for stopping by today and Happy Thursday!! I love how so many manufacturers offer a 6x6 version of their paper. 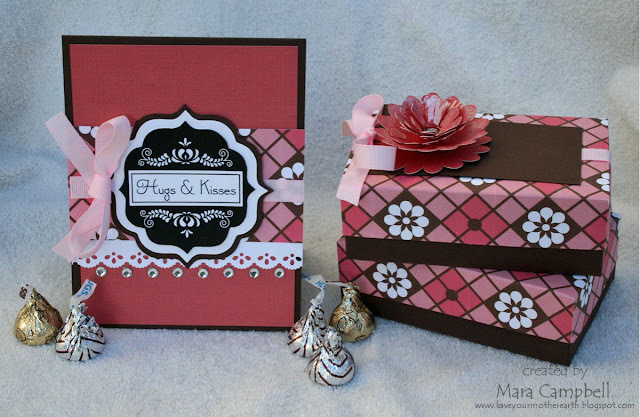 The 6x6 paper pads are perfect for cards and other smallish projects, like tags. There is nothing better than flipping through a 6x6 pad just looking for those patterns to call out to you...make a card out of MEEEEEEE!!!! True story, that's what happened to me the other night. My My Mind's Eye Honey Cake paper was calling my name. And I answered. I just started grabbing patterns and layering them like my life depended on it. Add shapes I cut on my Cricut, some lace, a button, baker's twine, and a Papertrey Ink stamp...and I had myself a card. I think my favorite is this pretty button with the baker's twine. Yeah for baker's twine!! 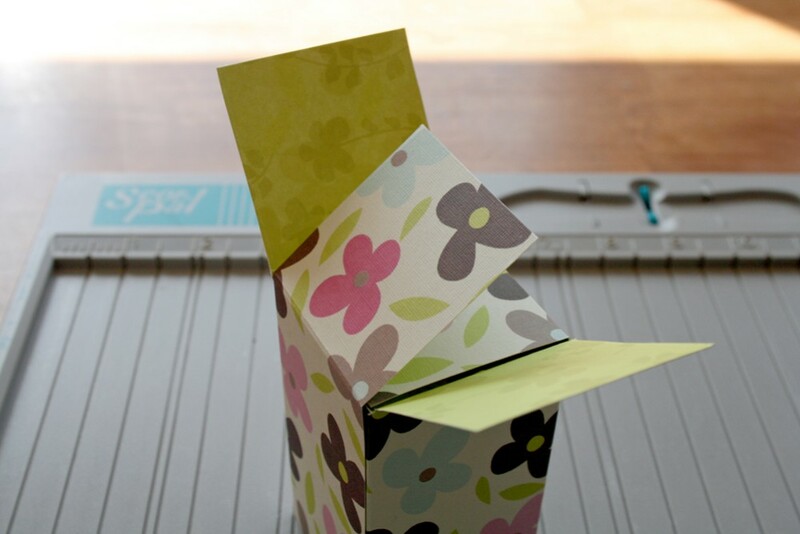 When is the last time you had patterned paper calling your name? Or does that only happen to me??? If there was ever a time to use O.M.G. and really MEAN it, this is the time. I know I always say that the recipes I post on my blog are fabulous or wonderful or great. But these are some of the greatest bars I have ever made. The recipe was spot on, they tasted exactly like snickers bars. These bars were definitely worth throwing my healthy eating plan OUT THE WINDOW for one night!!! Everybody absolutely loved them and my girlfriend actually made another pan Saturday morning because word got out. And everybody wanted some. 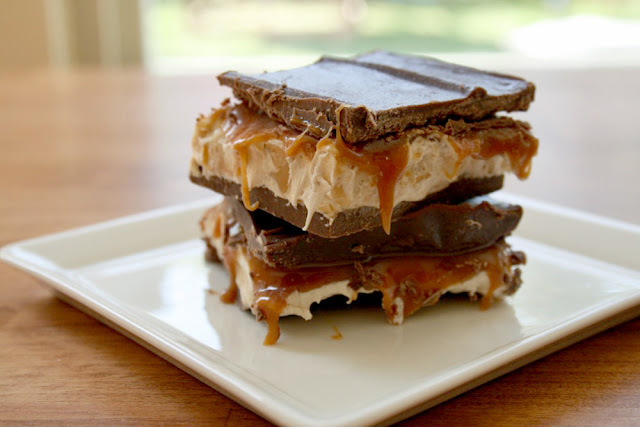 If you like Snickers, please make these. 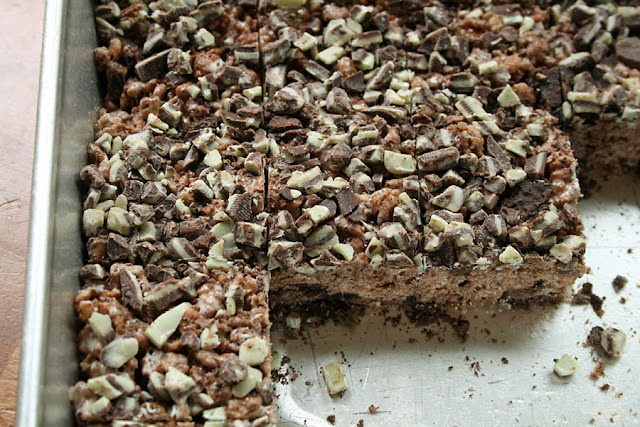 Because you will never eat another stale-been-sitting-on-the-Target-shelf-for-too-long snickers bar again. Baking night was definitely a success this time!! 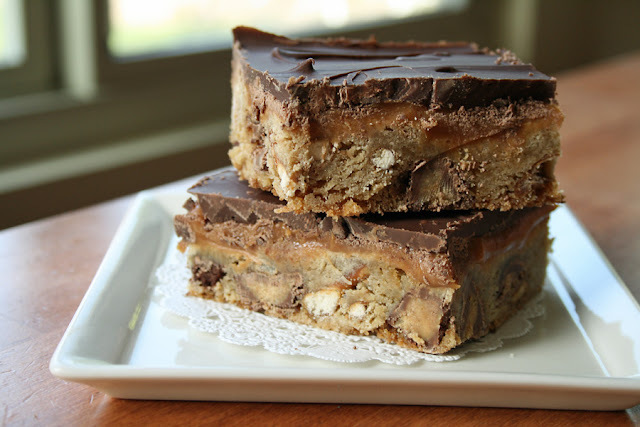 Here is the recipe from the Brown Eyed Baker blog: Homeade Snicker Bars. The recipe looks long, but it's really just melting ingredients and constructing the layers (with fridge time inbetween the layers). You don't have to turn the oven on at all. That's a bonus. Happy Saturday friends! What are you up to this weekend? We will hopefully be spending it outside soaking up the beautiful weather. And I guess we will also be losing an hour of sleep tonight, boo! I don't like that part of daylight saving, although I do like it staying lighter at night. So I guess I shouldn't complain. 1. Cut your paper 8.5 x 11 inches. Then cut this paper in half at 5.5 inches. You now have enough paper to make 2 treat boxes. I am using paper from the Chloe's Garden Pyramid Pad. 2. Score your paper on the longest edge at 2 inches, 4 inches, 6 inches, and 8 inches. 3. Flip your paper and score it along the short edge at 2 inches. 4. Using scissors, cut the paper at the 2 inch, 4 inch, 6 inch, and 8 inch intervals until it hits the long 2 inch score line. 5. Remove the little extra flap that is right past the 8 inch score line. 6. Apply adhesive to that little flap right past 8 inches. Roll your paper up and secure adhesive covered flap inside so it's not visible. 7. Now you need to secure the bottom of the box. Start by folding over 2 of the 2 inch flaps. 8. Secure the last flap with strong adhesive. If any corner are sagging, just add more adhesive or a little bit of wet glue to hold it all together. 9. 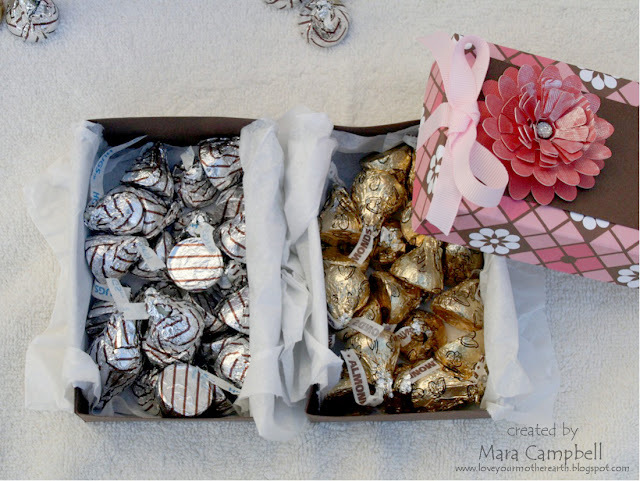 Now that you have this shape, you can make two different treat holders. 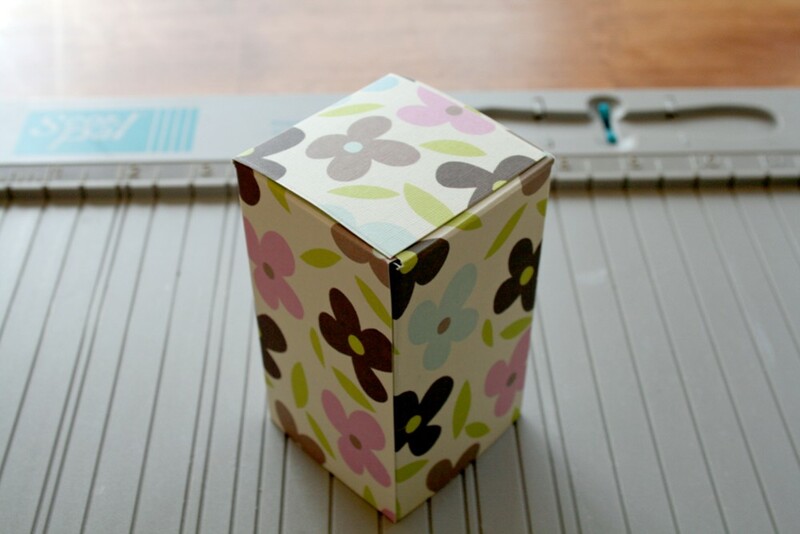 For the first style, pinch the top of the box together by pressing in two opposite side and pinching the top. 10. When the top is pinched together, punch a hole. Tie ribbon or baker's twine through the hole to close the box. You can embellish the front with matching anything! 11. For the second style, you don't need to pinch the top together. 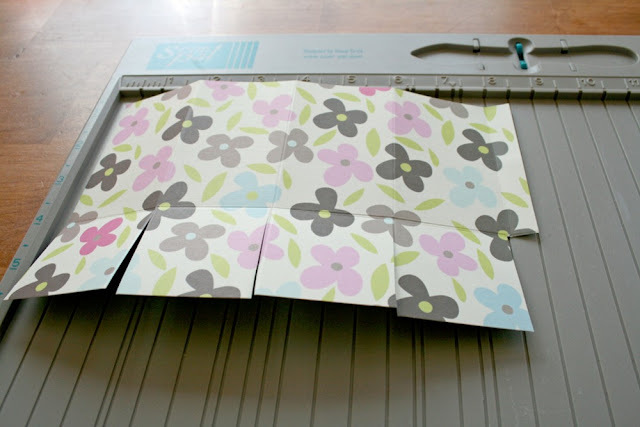 Cut a small strip of matching patterned paper and secure as a handle. Now you have a mini basket. For my basket, I used the opposite side of this patterned paper for the outside of the basket. And before I created my 2-4-6-8 score lines, I used a border punch to create a fancy top border. 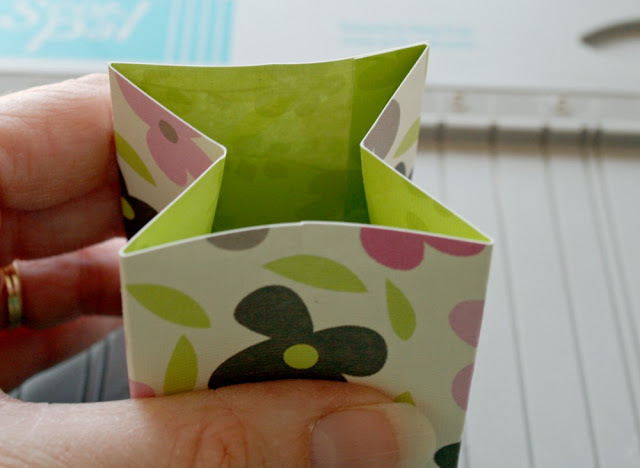 You can create two different styles from the same starting size of paper. Either of these would make cute Easter treat bags or baskets. 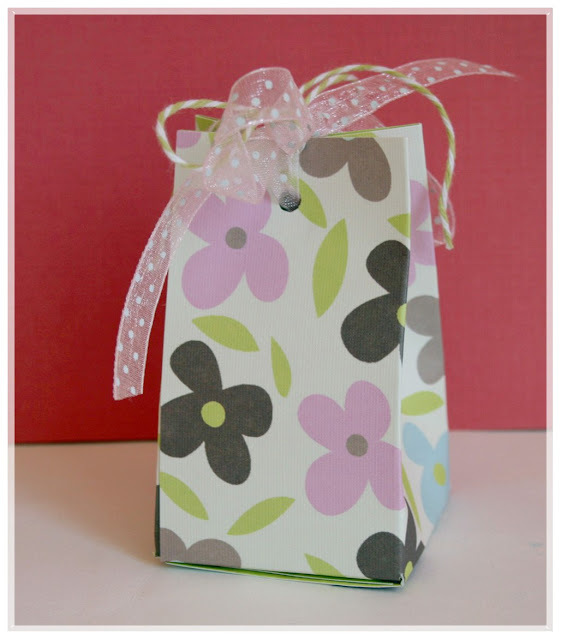 Or switch up the paper you use to create party favors, thank you gifts, a birthday treat. The possibilities are endless! These are big enough for a handful of jelly beans or hershey kisses or some small lip gloss or nail polish. They really are cute little treat holders. Or you could even use them a place settings on your Easter brunch table. I hope you enjoyed the tutorial. If you make some of these, please let me know! I would love to see what you create!! Thanks for stopping by today, have a great Saturday! I am always up for a challenge and I decided to tackle the CR84FN color challenge. Check out these trendy colors this week! 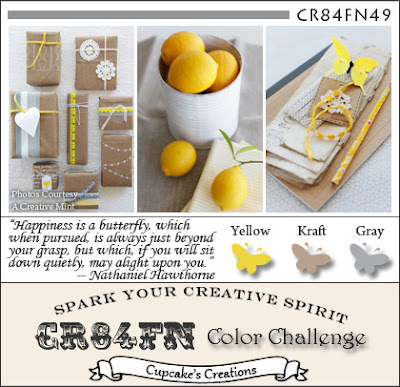 Yellow, craft, and gray...very pretty combo and very popular right now! I made some fun rolled daisies that turned out huge. I think they look good on the card but this card will never fit inside an envelope!! I painted them with silver stickles for a touch of glittery goodness. I also used my favorite border punch and accented the scallops with some bling. I *heart* bling. With all my heart. Have you tried this trendy color combo yet?? I think you have one more day for this challenge if you want to give it a shot. Thanks for stopping by today!